About two months ago, the most profound moment of my life occurred when I was named valedictorian of the 2012 graduating class of Bennett College. Outside of receiving an additional honors cord, I was expected to prepare a speech and deliver it in a chapel filled with students, parents, children, the college’s board of trustees – and the Reverend Al Sharpton. The audience would all be watching as I charged the graduating class to go into the world and showcase their excellence. As I prepared to deliver, there wasn’t a nervous bone within me; I had been groomed for this moment since birth. Five minutes later, the audience was on their feet, the local newspaper was snapping photos of me, and the incomparable Dr. Julianne Malveaux was telling everyone how far I will go in the world. In all of that praise, all I could do was scan the crowd in search of the two people who matter the most – my parents. That moment belonged to us. It was our victory and celebration. Together, we had conquered “it.” That moment was the culmination of faith, dedication, and sacrifice. It was special because six years ago, I was incapable of leaving the house. Suffering through Agoraphobia, I was trapped as a prisoner of my own misguided thoughts. That’s what Agoraphobia does to its victims; it isolates us from the world by making us afraid of the thought of what could possibly happen to us if we leave. 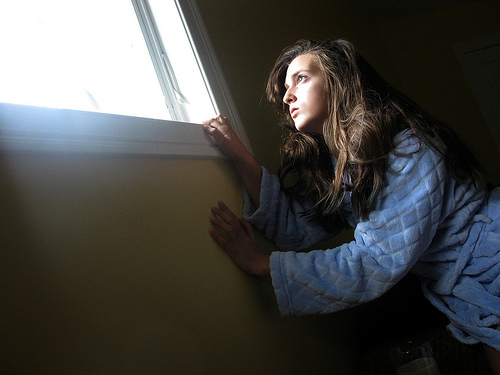 Often, Agoraphobia leads to suicidal thoughts and tendencies. A lot of us kill ourselves because we believe that the only way to escape our own personal hell is death. I am one of the fortunate ones because I survived. I escaped. With the help of my mother and father, I battled this seemingly inescapable illness. Both of them were there, missing work to accompany me to appointments with my psychologist and our church counselor. They became advocates by supporting my decision not to use medication to battle the disease. And when the state was threatening to incarcerate all of us because I was truant, they remained steadfast. Regardless of the numerous court dates, I refused to attend school. This seems weird coming from a 4.0 scholar with a full-ride assistantship to graduate school, but I hated junior high and high school. The teachers and students loved me, but “potential” haunted me. I was always too smart, too gifted, and too brilliant, but I couldn’t live up to the expectations. I couldn’t fulfill my unparalleled potential which triggered my Agoraphobic episodes. My grades suffered and alternative school wasn’t an alternative so I stopped going. Then, out of faith, resilience blossomed. God’s fortitude removed the mountain that had been blocking me from seeing the greener grass on the other side of mental illness. In 2007, I realized that I was stronger than this illness; it was conquerable. Against all odds, I beat Agoraphobia. I attained a GED, applied to college, and was accepted to every school I applied to. In the process, I decided to pursue a career as a journalist. Zora Neale Hurston sustained me during Agoraphobia, so I desired to follow in her footsteps and use words to change the world. Suddenly, the teenager who was afraid to even answer the phone was being read in Australia. Although I was using words to inspire, I hid Agoraphobia as an unwanted skeleton in the closet. I was ashamed. Yes, I had laid my burdens down and picked up a crown, but I refused to acknowledge the storm I endured to reach the kingdom. In shaming Agoraphobia, I was providing a disservice to the 0.8 percent of the United States population suffering with this disease. Instead of being an advocate for Agoraphobics sufferers who are prisoners in their homes and their minds, I was running from the past. Then, I realized that I had been given a platform to share my testimony in the hopes of inspiring and encouraging others. As Bassey Ikpi and others did before me, I started to tell the world what I had gone through. And it has been the most freeing experience. As journalists, we are taught that we’re supposed to tell other people’s stories- not our own. Though this is a journalistic standard, what makes Oprah so successful is her ability to relate to others because of her own challenges. She has never been afraid of breaking that journalism rule and neither am I. I am choosing to break my silence by being God’s vessel instead. On the first ever “No Shame Day,” created by Bassey Ikpi and The Siwe Project to “push an understanding that mental illness should not define the identity of those who have it,” I was challenged to destroy the stigma of mental illness and share my victory to inspire others to seek help in this battle. Mental illness plagues our friends, families, and our significant others. It’s time that we remove the mask and start discussing the stigma of these diseases. That’s my mission in life. No, I don’t write often about mental illness, but the issues I do choose to discuss allow me to provide a voice to the marginalized. I’m Evette Dionne Brown, a writer, fashionista, and mental health advocate, and I have no shame in admitting that I am a survivor of Agoraphobia. This article was cross-published on Urban Cusp. This article really touched me because I also suffer with agoraphobia. I have been agoraphobic for almost 2 years and it has been a long and slow battle. Many people don’t realize panic attacks are the sole cause of the agoraphobia and it truly “messes with your mind”, your story is very inspiring and I hope to rise above this fear one day.